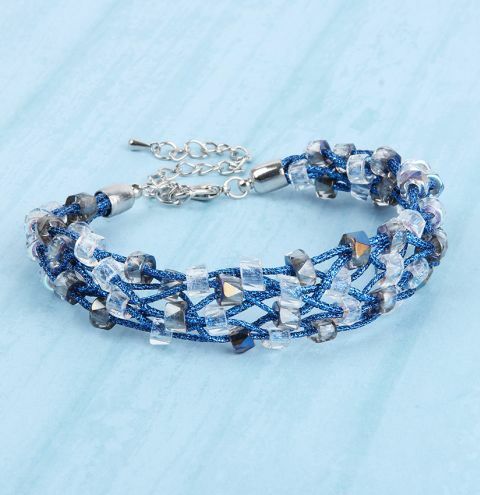 *SALE MAKE* learn how to make a sparkly woven bracelet with glass rondelle beads and glittery cord from the Biggest Sale Ever. Cut your cord into eight equal lengths, we used the whole length of cord which is two metres. Use the glue to attach on one part of the cord end/extension chain – all eight strands will go inside. String each bead onto two strands each time. Thread the beads on randomly so the beads aren’t going onto the same two strands each time. This will create a braided effect as the cords cross over each other and are linked with the beads. Continue to add single beads and choose to thread them onto different pairings of cords. You may need to keep trimming the cord ends as it does fray. Once you have reached the desired length trim the cords, so they are all equal length, then glue on the other part of the cord end/extension chain. Once the glue is dry your bracelet is ready to wear.